My parents love birds and do a lot to attract them into their garden. 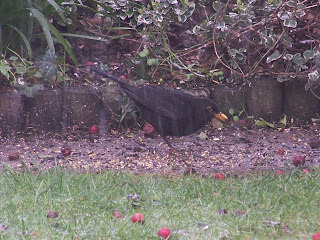 One of my favourite birds, who has been there for a few years, is the one leggy blackbird. It is so fun watching him hop around the garden. He can't go onto the bird feeder as he can't balance very well so he eats the berrys and seeds which have fallen on the floor. Having grown up around my dad who loves nature and especially birds I love them and think it is so relaxing sitting in my parents dining room watching them. Soon they will have all the babies around too which is lovely to watch. I bought my dad a birdhouse for christmas last year and they had bluetits in there within a few months, which is very unusual. It obviously make a cosy home as they seem to have some back again this year. As we have three cats we don't really get that many birds in our garden so I miss them. Awwww poor old one leggy bird! We used to have blackbirds in the garden, but when we tidied up the jungle that had overgrown they left us *sobs*.